The latest Humble Mobile Bundle is halfway through its availability period, and that means it's time for more games. The NEOGEO bundle has been updated with three more classic titles in the premium tier, and we've got 10 codes to hand out. Even if you don't win, this is a pretty great deal for 11 games. 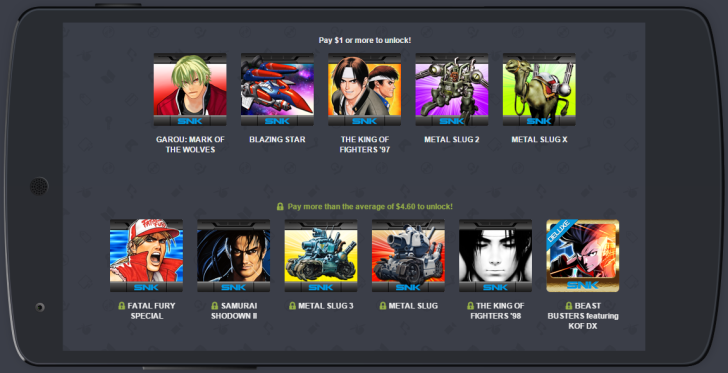 The new titles today are Metal Slug, The King of Fighters '98, and Beast Busters featuring KOF DX. They are all in the premium tier, so you'll only get them if you pay above the average price, sitting at $4.60 as of this posting. Anyone who bought the bundle previously will have the new games added automatically as well. Okay, as for the giveaway, here's how it goes. We've got 10 codes that grant access to the full bundle of games. If you want to enter the drawing for a code, just leave a comment below. We'll choose 10 random winners tomorrow (July 28th). Good luck!